Architectural Detail III shows a beautiful column detail as its subject. The subject of architecture is a classic theme for artists, and here we see a modern edge to this theme. In photographic realism style, we see the column details intricately reproduced. Rosettes are included in the decorative design to add beauty. Like its companion work Architectural Detail IV, this piece is in subdued tones to accentuate its texture. 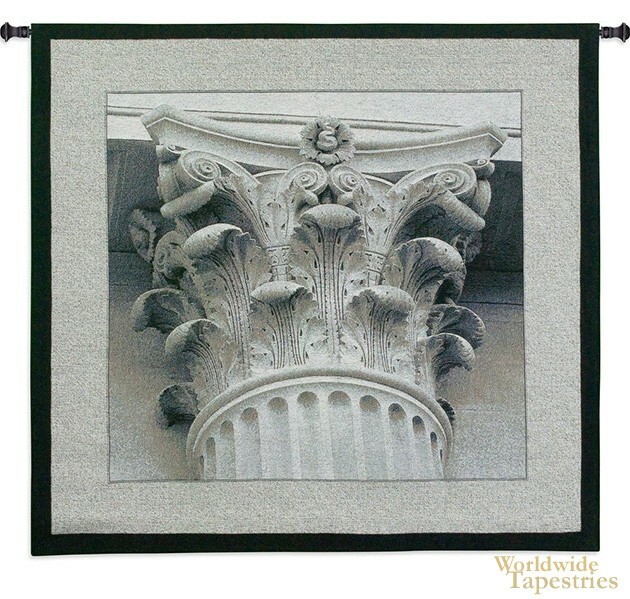 This Architectural Detail III tapestry is backed with lining and tunnel for easy hanging. Note: tapestry rod and tassels, where pictured, are not included in the price. Dimensions: W 35" x H 35"